Synopsis: "Three generations come together in the week leading up to Mother's Day." Yup, that's all I got from IMDB. Not helping right? So you better watch the trailer above! *giggles*. This comedy film is directed by Garry Marshall features awesome actor and actresses like Jennifer Anniston, Kate Hudson and Julia Roberts. And if you don't know I love Julia Roberts (pstt.. Notting Hill)!! From the trailer I'm sure it will be a heartwarming (and funny) movie so it would be perfect to watch with your mom! 1. Like 1 Utama Facebook Page and mine at TheThinkerBelle. 2. Comment down below on 'Why Mother's Day movie will be perfect for you and your mom?" along with your name and email address. 3. Share and like this post to your Facebook and tag 1 Utama, TGV Cinemas facebook and 3 friends. The screening will be on 3rd May 2016 (9PM onwards) at TGV Cinemas, 1 Utama! This contest will be going on starting 20th-24th April 2016. 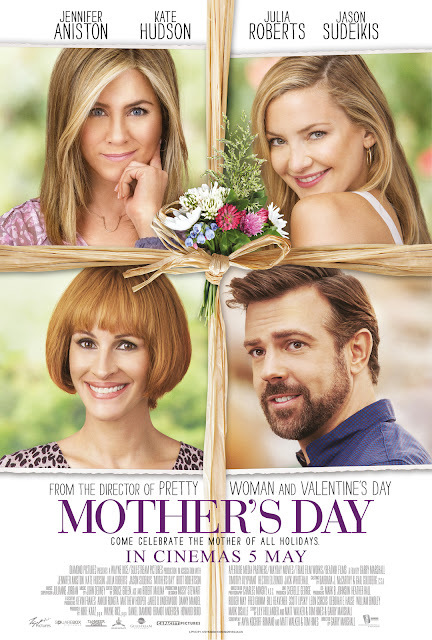 I will pick 10 winners to receive a pair of Mother's Day premier screening tickets and a set of premiums each. So good luck! P/S: I will announce the winners next week so come back and check on my Facebook Page! Ooo ooo ooo nice nice!! I definitely want to watch this movie because it not only tells the tale of so many different mums but also a Mr.Mom! Surely a great mothers day movie to watch! Never went to movies together with my mum. Definitely a new experience for her! Such a nice event for Mother's Day. But I can't join, don't think worth it going from Shah Alam to 1utama on weekday evening, the jam... :( Will plan something else instead to celebrate it. Good luck to all participants. Wow so nice. Watching movie is a good idea to celebrate Mother's day! Mother's Day movie will be perfect for me and my mom because both of us love to watch movies. Hope that we can spend more time together doing the things that we love. Good luck for the giveaway and to everyone who participates. too bad i am not around during the screening. all the best for those participate in the giveaway. The movie has a stellar cast. Will surely watch. Good luck to the participants. Yay I have joined this and hope I dapat ya. This Mother's Day contest will be perfect for me and my mum as we never got to watch a movie together and we love all the amazing cast on this movie! cant seem to find time for movies nowadays.. sigh ><.. good luck to those joining! "The screening will be on 3rd May 2016 (9PM onwards) at TGV Cinemas, 1 Utama! This contest will be going on starting 20th-24th May 2016." Typo there. I believe it should read "This contest will be going on starting 20th-24th April 2016." Thank you for the contest and all the best to the participants. I watched the trailer of this movie, I prefer this kind of movies, also really wanna get good feeling from this movie with my wife which may be future mom! Mother's Day movie will be perfect for me and my mom as we get to spend time watching a great movie, indulge in great popcorn and just be there for the women that had taught me so much! Mother's Day movie will be perfect for me and my mom as we both love watching movies, indulging in delicious popcorn and just spending the day with this women that had taught and given me so much! Good luck to those joining, my mom doesnt like movies because she feels its a waste of time lol or maybe she just cant sit still.